DO YOU HAVE THESE WORRIES? ♥ The tire leaks over time even the best condition. ♥ Tire pressure varies with temperature. ♥ As a result, low tire pressure increases fuel consumption. 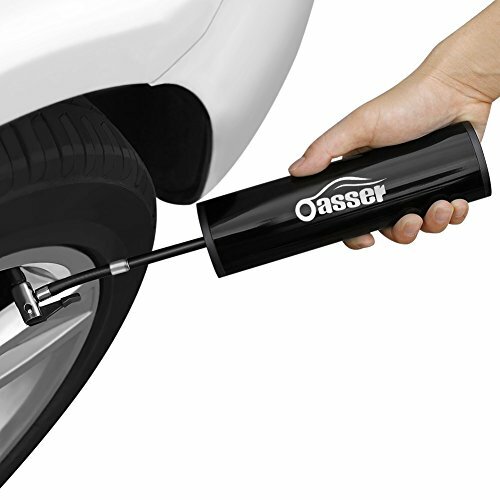 GET ONE OASSER P1 MINI TIRE INFLATOR NOW! IT GIVES YOU PEACE OF MIND ON THE ROAD! ♥ SAFE TO USE : OASSER P1 mini tire inflator will monitor pressure and stop at your set pressure (Max pressure 150 Psi. ), which avoids over inflation. ♥ MULTI-PURPOSE : Suitable for small and medium sized car, bike, motorcycle, sports equipment and inflatables (NOTE: It cannot be used on trucks). ♦ Please read our instruction carefully before using it. ♦ The tube will get hot after the inflator has worked for a long time. So please do not pull out the tube from valve core and from inflator until it is cooled down. ♦ Please connect the inflator with car charger instead of connecting it with the wall socket while pumping something, because the output of wall socket can't reach the current required when the inflator works. ♥ Step 1. Please screw the tube into the bottom valve core (not DC socket). ♥ Step 2. Please press the button "UNIT" to wake the display. ♥ Step 3. Please press the button "+" and "-" to preset tire pressure and press "UNIT" to confirm. ♥ Step 4. Please press the power button to start inflating. ♥ Step 5. It will stop when the set pressure is reached. ♥ Step 6. Please press the power button to turn it off when you don't use it or when you want charge it. 【Preset Tire Pressure】Preset required tire pressure (Max pressure 150 PsiI) and press power button to start inflating, The tyre pump will switch off automatically once the preset pressure is reached.